Olemme keränneet ja analysoineet 36 käyttäjien arvostelua kansainvälisistä lähteistä. Käyttäjät arvioivat sen 89/100. Keskimääräinen arviointipvm on 18-05-2016. Olemme verranneet näitä arvosteluja 179720 arvosteluun kategoriassa Audiolaitteet. alaScore™ tälle tuotteelle on 89/100 =Erittäin hyvä. Viimeisin päivitys: 19-04-2019. I bought this product in February 2017 and I love it great sound reproduction also love the light affect and all the extras. No dab radio..speaker leads not long enough. Looks fab and sound excelend. 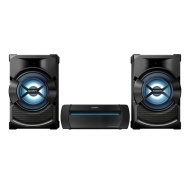 Sound system is excellent ,and good price. Thank you,Argos! I reeceived this item about half year ago : I'm very pleased about the item and service. Much bigger than anticipated, but absolutely brilliant sound, especially at higher volumes. Lights a bit gimmicky but still ok.